Dr Block claims that “the European cosmetics industry [has] reduced its microplastic usage by 97% by May 2018”. 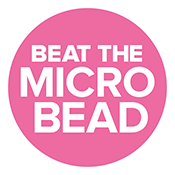 This is a false claim as it is evident in the Beat the Microbead database that there are still several products containing microplastic ingredients such as polyethylene, styrene/acrylates copolymer and even nylon. These microplastics can be found in all sorts of products like make-up, anti-aging creams, sunscreens, shampoos and shower gels. The claim of reduction may be explained by the industry’s “voluntarily” removal of microbeads from their rinse-off cosmetics due to public pressure and environmental campaigns like ours. But microbeads used in scrubs are only one part of the extensive range of micro- and even nano-plastics used in personal care products. PlasticsEurope’s representative Dr Christian Block further pleas for a lower size limit in the definition of microplastics. The European Commission defines microplastics as anything below 5mm, but he argues that this should be from 5mm-1µm. Without a lower limit, the door to eliminate “all polymers used to formulate soap and detergents” is open, thus confirming the use of these ultra-tiny microplastics by the industry. The logic behind not using a lower limit is conflicting with environmental interests as the following image illustrates: the smaller the plastic particle, the more harmful it potentially becomes for life. The image above, part of a scientific paper titled ‘Marine microplastic debris: An emerging issue for food security, food safety and human health’ recently published in Marine Pollution Bulletin, demonstrates that a plastic polymer particle smaller than 0.1µm may have “access to all organs, translocation of blood-brain and placental barrier”. But also, particles smaller than 150 µm can already be absorbed by our lymph system. The health impact of plastic should be a major concern. This topic was apparently lacking in Block’s speech. Are we exposing ourselves on a daily basis to chemicals that are potentially dangerous to our health and to the health of our fellow species? The cosmetic industry should further research on the impacts of the microplastic ingredients before using them. As far as the plastics in cosmetics are concerned, they are nothing but a design error!